This is an interesting story. 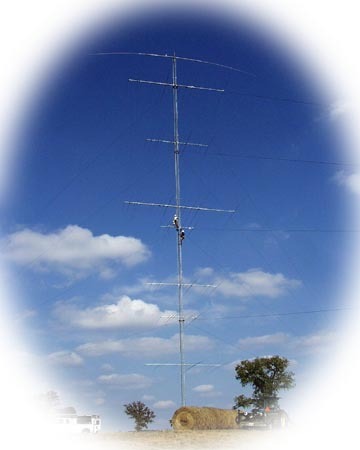 Al had only three tri-band antennas on his 200' tower to start. they were layered down from the 200' point. He complained that 20 meters worked very well and he was seeing the stacking gain but on 15 and 10 no such changes were noted. I modeled the stack for him and established that his angles no matter what combination he used were way to low. Something on the order of 3 degrees. We tested this out with a spectrum analyzer and sample antenna on top of a nearby ridge. Sure enough, the staks were working we could see the gain as he added antennas but it was at a way to low angle. The solution was modeled add 2 more tri-banders, and we could start to create lobes at much higher angles. AL purchased two more Tri-banders and Custom Metal Works put them up. Now how to control all 5 of them. W5IZ needed a customized StackMatch system to allow all the major combinations of the 5 tri-banders in his stack. We developed a system like NO8D's which selected the antennas in all combinations as well as individually. We cabled the system up and immediately started to hear the differences on the bands. You can now hear AL working DX and playing with all the right angles to maximize signal. 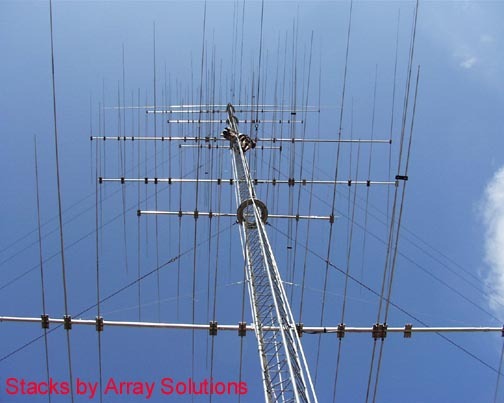 The two 40m beams are also stacked with a StackMatch.